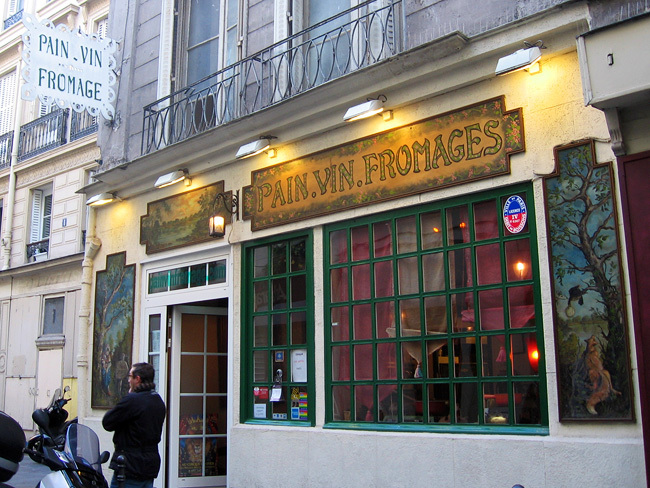 ﻿ Cool Stuff in Paris | Pain, Vin, Fromages - Bread, wine, and CHEESE! Lactose intolerant folks stay away! Pain, Vin, Fromages is one of my new favorite restaurants in Paris, and as the name implies, they serve (almost) nothing but bread, wine, and CHEESE! The first page of the menu is a big map of France divided into regions, with half a dozen cheeses listed for each region. Simply choose a region and they bring you the six cheeses along with basket after basket of slices of fresh baguette. Select a bottle of wine, maybe throw in a plate of cured meats and cornichons, and you've got a delicious and traditional feast. I cherish every time I have friends in town just so I can take them to this place. The restaurant is hidden on a tiny street just across from the Pompidou Center. The interior of the ground floor is decorated in traditional French countryside style, and the downstairs is a small and cozy 18th-century wine cellar. If you love cheese, don't miss this place!